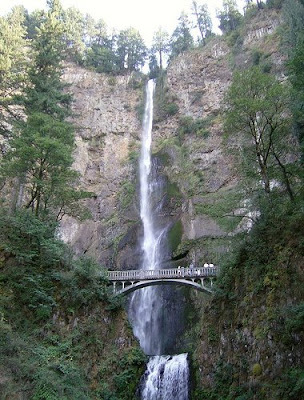 Multnomah Falls is one of Oregon's oldest and most popular attractions. Millions have visited this beautiful Oregon landmark which lies less than an hour from Portland along the Columbia Gorge National Scenic Byway. Multnomah is one of the tallest waterfalls on earth and the second tallest in the USA (Yosemite Falls is first). Multnomah's concrete bridge, which began as a massive wooden log bridge about 100 years ago, gives the area an almost surreal appearance. The falls are only minutes away from the I84 turnout, and the walk up to the bridge is only an extra 5-10 minutes. For the adventurous there are extensive hikes up and over the falls in the wilderness areas south of Multnomah. Check in at the information center for more information about the region. Definitely some serious competition for our Hawaii waterfalls! Awesome place for picnic.In the camera this place will be the best click of the day. I used to write a lot papers about historical places in US college. I used https://samedaypaper.org/blog/5-page-paper-writing to get advices. Now I see that I'm still interested in it.